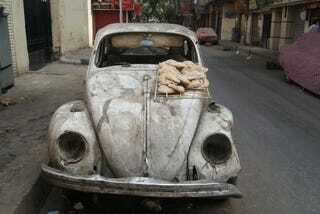 This Volkswagen has been rotting in Mostafa Basha Kamel, Cairo. As a stray dog's refuge from the scalding sun, an improvised clothes stand or a corroding, fossilized memento from the 1940′s, an abandoned old car lurks around every street corner in Cairo. With a population of 18 million people, the current traffic laws and violations thereof, it is no surprise abandoned cars have taken control of the streets. At first glance, the wrecks are infuriating obstacles for pedestrians and considerable sources of pollution. Through the baked layers of dust, a closer inspection reveals that these discarded vehicles are often a collector's dream. Perhaps most importantly, they reflect the intricacies of Cairo's public spaces. A 1970 Mustang on Champillion Street. Before opening his restaurant in downtown Cairo's Al-Takaeba, Ahmed frequented the ahua (coffee shop) outside his business. For almost a decade, the young restaurant owner has been staring at the same decaying car sitting amongst faded plastic chairs. The baby blue car is used for storage and has been rotting on the street for nearly a decade, explains Ahmed. The unconventional storage unit probably belongs to one of the mechanics working in the area, and so far, there have not been any attempts to remove it. "People get used to almost anything," says Ahmed, even if it impacts the view or affects business in the street. In Dokki, the governorate directly across from downtown Cairo, Khaled tends to his ahua (coffee) and stirs the burning "wella" for the shisha. With its fair share of abandoned cars, Khaled believes the four-wheeled relics of Gaber el Hayyan Street belong to people now deceased, but are kept by their relatives as memorabilia. "Some cars were towed and taken to a junk yard in Helwan," says Khaled about a communal effort to get rid of the cars by shopkeepers who sought help from traffic officials, "but those which belong to influential people remained on the streets." For Khaled and his neighbors in Gaber el-Hayyan, the abandoned cars are no different from the piles of trash in the streets. One day the government may try to purge the streets of the cars, but "that won´t happen anytime soon," declares Khaled quite frankly. This car off Dokki bridge has become an unconventional fruit stand. However, in Egypt, things are not what they seem. Just a block away from Abou Tarek, the famous three-story koshary restaurant in Champillion Street, Magdy leans suavely against a parked car. "Every car has value," he says, adding that the main reason why cars are abandoned on the streets is that fixing them can cost up to EGP 15,000 when their actual price is only EGP 2,000. "People prefer to sell them to car mechanics who make good business from spare parts," explains Magdy, asserting that it is a better alternative to spending lavish amounts of money. "After the revolution, people don't have the money to buy new cars," says Salah, a car mechanic who works near Magdy. The high price of fixing cars has led drivers to adopt other means of transportation. Cars are abandoned and replaced with the spending of a couple of guineas (Egyptian pounds) on the metro. Interest in the old cars on Champillion Street does not go unnoticed by the community. The men who grow old alongside their four-wheeled counterparts enjoy the interest they attract. People´s aching for the old days tends to get the best of them and opens the door to an entirely new perception of the same abandoned cars that disrupt street life. "Egyptians love old cars," says Eslam, owner of a 1960´s Opel car that he inherited from his grandfather and is slowly repairing for both sentimental and economic reasons. Unlike most cars in the area though, his is safe inside a garage. Eslam's Opel, inherited from his grandfather. "This car is worth 100,000 L.E…Old cars are strong," he says proudly, noting that some mechanics specialize in fixing old cars. Despite the great value of the car and the fact that it could easily feature in a museum exhibit, when asked if he would ever sell his car Eslam's answer was an astonished and slightly offended, "no way." The Opel is not the only jewel on the streets of Champillion. A 1938 Ford classic, a 1950s Bali and a 1960s Mustang are some of the many survivors of decades long past, putting the abundance of 1980s Volvos to shame. Whether they are inside a garage or on the streets of Cairo, their owners consider them worthy of that piece of earth. But how do pedestrians deal with the vintage cars? In the same way that vintage car owners have asserted their right to occupy space regardless of the decaying state of their car, pedestrians have moved out to the street, often unaware of the incessant flow of traffic. It is certainly a balancing of interests, but any congestion caused by these old cars is not unique to pedestrians. Ahmed Roham insightfully notes that if there are roughly 50,000 streets in Cairo and at least two abandoned cars per street, then we have 100,000 parking spaces going to waste. If humans are not using them, stray dogs definitely are. In 2013, 6.607 million licensed vehicles in service were roaming the streets of Cairo, reported the Central Agency for Public Mobilization and Statistics (CAPMAS). While CAPMAS reported 3.232 million registered vehicles were privately owned, the statistics did not count the abandoned vehicles which were generously labeled by CAPMAS as "out of service." As a matter of fact, Cairo's frightening traffic jams and the overcrowding of the streets is more than just a daily subject for small-talk. It is as intrinsically tied to Egyptian life and culture as foul and ta'ameya are. As proud of their abandoned cars as they are of their infamous streets, Egyptians often choose to joke about the two million registered motorcycles, 5,000 tuk-tuks and three million taxis which, when not paralyzed by traffic, speed manically like bumper cars. Yet the question of why valuable, limited space in the streets is occupied either by what some consider dear private property or by governmental negligence still hangs in the air. The problem of abandoned cars is a matter that must be explored further if we ever want to understand the condition of our streets, and most importantly, the Egyptian psyche which brought them to being.